I was introduced to Project Treasure at a time in our life when it was needed the most. My dad had just died from cancer and my mother was grieving and alone for the first time in 38 years. I had been thinking of a way to show her how much she is loved by all of her family and friends and found the perfect gift with the keepsake treasure box from Project Treasure! What is Project Treasure? It is an online website that was created to make it easy for family and friends to write heartfelt notes for a selected recipient. All of the notes are then printed on the highest quality, beautiful paper and assembled together with a pretty ribbon and placed in an heirloom style wood treasure box and delivered to the recipient. 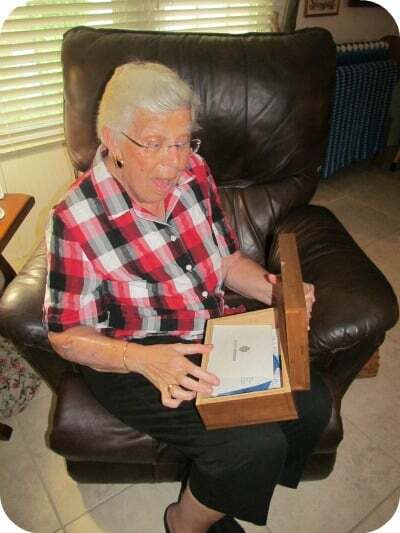 Project Treasure is a very user friendly website to navigate and I was able to coordinate a treasure box for my mom. It was so exciting to have this “little secret” planned for her friends and family and I was even able to reach out to her best friend of over 55 years that she hasn’t seen in person for a very long time. 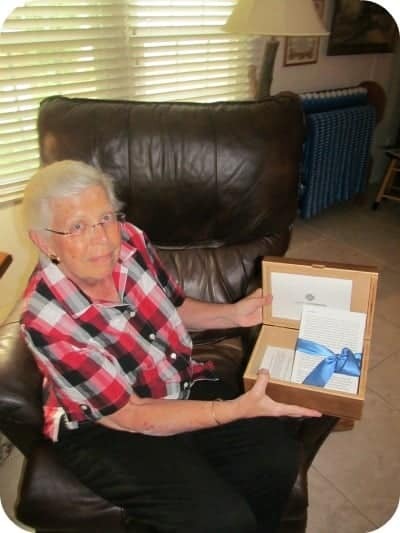 Her friend was able to submit a personalized note via computer from over 1,800 miles away and it was included in my mom’s treasure box much to her delight. As the coordinator of this Project Treasure, I was able to select the select the chest, recipient and date that it will arrive, invite contributors to submit a personal note and write my own special note. I scheduled to have my mom’s treasure box arrive just prior to our weekend arrival at her home (she lives two hours away). I received a phone call from my mother who was overcome with joyful emotions as she expressed that she had just gotten a “magnificent gift” and spent the last hour reading notes from her friends and loved ones. She was so surprised and said, “this is absolutely amazing….how did you get all of these people to send a note to me?” I felt a wide range of emotions too but especially appreciated that I was able to do this for my mom so that she would know that she is never alone despite my dad’s passing as this is a reminder of how much she (and my dad) was loved by so many people! The treasure box itself is absolutely stunning as it is handcrafted using sustainable bamboo and the attention to detail is exquisite. 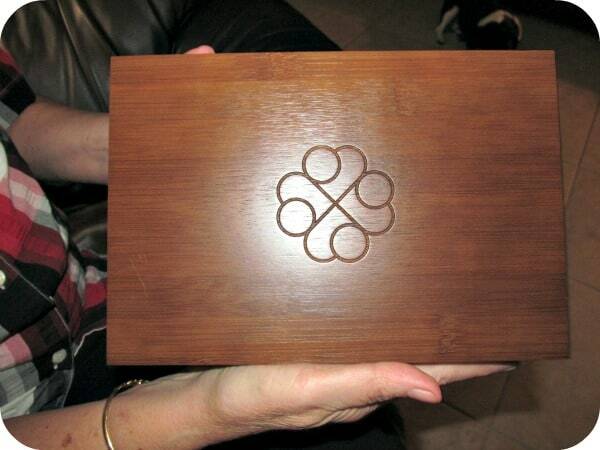 The Project Treasure symbol is carved into the lid and there are beautiful layered edges. My mom proudly displays her treasure box and I plan to keep this in our family for generations to come as a family heirloom. Project Treasure is a wonderful way to memorialize someone special and a great way to let someone important in your life know that they are loved and “treasured”. Especially at the holidays, which can be a lonely time for those separated from their loved one, Project Treasure would be a heartfelt gift idea. Are you ready to coordinate your own Project Treasure……..? Go ahead, I promise it is easy to do and the impact on someone’s life is a timeless reward. Project Treasure is available for only $49.95 (an excellent value in my experience) and includes up to 25 notes (you can add more for a small additional fee) and a gift wrapped bamboo treasure chest delivered to your recipient. You are invited to visit Project Treasure to get started. I like this idea. Whenb my sister passed we each wrote a letter and buried it with her. I really really like this idea. I learned that you can purchase an individual note. I love the box and the wayProject Treasure puts it all together is beautiful! Beautiful and such a great sentiment for those who have lost someone. I want to get one for my cousin and his wife who lost their 4 day old daughter 10 1/2 months ago. I know that they know that we love them but this would give them something to keep and something they could look at whenever they’d like to know that we are thinking of them. The Organza Bag is cute. I learned that each chest is handmade by craftsmen. This is SO cool. I love how you can pull together the sentiments of many to give to someone who is going through a rough time – that is just amazing! I like how you can customize it. A chest for baby’s first birthday can be kept and filled over the years with memories and advice from family. Send an18-year old into the world of responsibility with a chest full of advice and good wishes. I like that you can buy individual notes to add to your collection. I love the bamboo boxes, and the fact that all these mementos and tokens can be gathered in one beautiful place! Lovely idea. I also like the notes in organize bag. I love this! I could see the Chest with Notes being a beautiful wedding gift! Beautiful and such a great sentiment for those who have lost someone. I learned that each chest is handmade by craftsmen who have honed their skills in the cabinetry trade!! I like the meaning behind giving these treasure boxes. I would love to give my kids each one. I really like their mission statement and how they believe I believe that gifts should have meaning. I love that it helps you give a meaningful gift!! I really like that they choose a charity every month and donate $5 of every sale to that charity. Very cool! The provide help to start your writing. I like the notes with chest. What a great idea and I learned giving a chest on your anniversary lets you fill it with sweet notes, but more importantly allows you to continue sending notes each year, the rest of your life. The messages submitted by family and friends are printed individually on high-quality note paper and bundled into a beautiful keepsake chest.